Sunday morning we boarded the Victory Junk (the actual name on all the crewmembers’ shirts) and headed out on the bay. This was after many of us bought the cone-shaped, straw hats of the locals, and I bought a big floppy Southern belle style hat. The sky was bright blue and there was a breeze, but it was still very hot and I am trying to prove my maturity by protecting myself from the sun and not letting a sunburn ruin my day. Thanks to Mrs. Paris and all the reading I’ve been doing I’ve learned enough about Vietnam’s history, and our history with Vietnam, to appreciate even more the surprise people have expressed at us moving over here. I was unaware of so much – including how closed off the country was (to us and by us) even sixteen years ago. 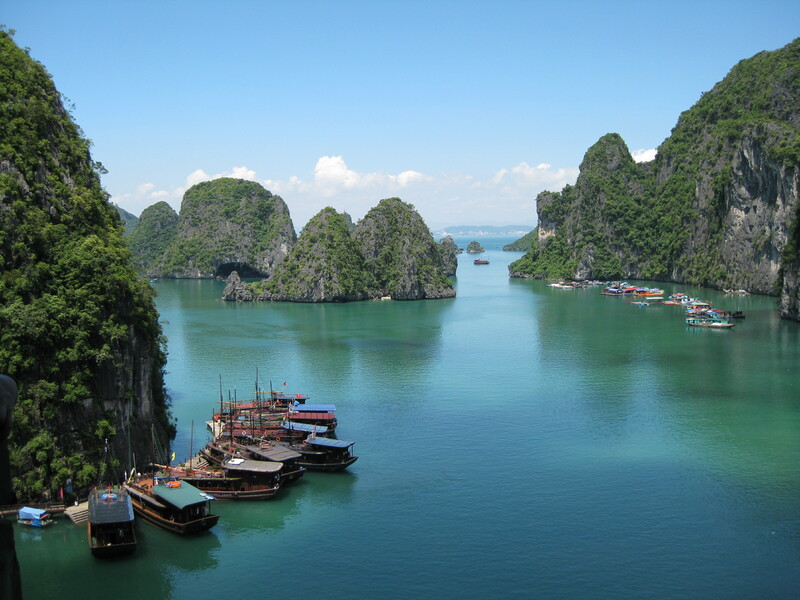 Partially because of this lack of access and exposure, Ha Long Bay is still relatively quiet and unmarred by tourism (though it seems well on its way to changing that.) Mrs. Paris proudly told us, though, that it has been named one of the natural wonders of the world and recognized by UNESCO for its aesthetic value and its geological and geomorphological value. 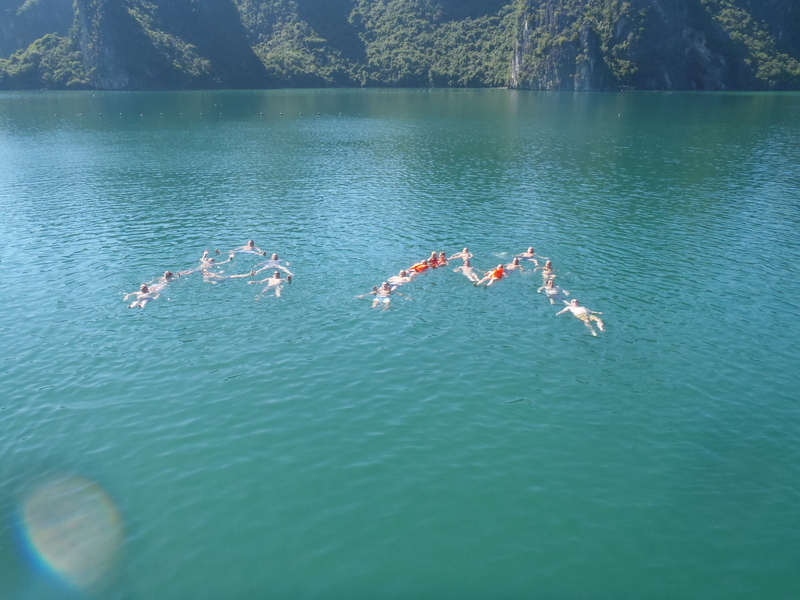 We spent the first few hours gliding among hundreds of islands – examining the rock formations, playing the island version of picture in the clouds, and being amazed by the floating fishing villages (complete with banks and TVs). They say the children there can paddle before they can talk. It’s hard to imagine a life built on water and surrounded by these islands. What would they do if they landed on the street in NYC? We were told how lucky we were to have such a beautiful day. Evidently, it’s often rainy and foggy, but that day it was so clear you could see the four-month old suspension bridge back in Ha Long City. The water is bright greenish-aqua, but lacked the top to bottom clarity of the Caribbean. The deepest part is only about sixty feet. I read that it’s clear in the spring and summer. Unfortunately, there was also a lot of rubbish floating around. Our first stop was the Sung Sot Cave or Grotte des Surprises (Grotto of Surprises). The surprise is in its size. We climbed fifty steps up the island to walk through several massive caves covering over one hundred thousand square feet. In some places the ceilings reach almost one hundred feet. They have designs in them that look like inverted waves – supposedly created when the cave was much lower than its current sixty-five feet above sea level. The stalactites and stalagmites were awesome – the perfect setting for a spooky movie. We were told that during the war the Vietnamese hid from American planes in these caves. The entrance was completely covered by large trees, and there is a spring with fresh water inside. On the boardwalks back to the pier, we passed little boats with ladies in them surrounded by floating baskets of all kinds of sea creatures. These ladies are so concerned about protecting their skin from the sun only see their eyes are visible. They wear long sleeve shirts, face masks, and head wraps. I believe this is where our lunch was purchased. Once again, we dined in style. Each table in the cabin was covered with linens then served soup (chicken and corn – but it tasted like chicken noodle), cucumber salad, crabs, prawns, spring rolls, fish, cabbage, rice, and fruit. Before lunch, we had been using the cool, lemon-scented, rolled towels to wipe our faces, necks, chests, and yes, armpits (everyone was sweating through their clothes, and some may have been smelly), and it wasn’t until after the dirty, messy, juice-and-guts-flying-everywhere crab course, when we furiously scrubbed our hands with said towels, that we wondered if they had been recycled… Over here, you never, ever know. So we swam – and it was beautiful. The water was a refreshing, though it was an odd mixture of hot and cold. The warm was lazy and comfortable. And then every once in a while you’d cross a cold patch, and it would make you feel so alive. The contrast was beautiful. The salt – on the skin, in the eyes, and on the tongue – was a bit of a shock. I could see down my hot pink toenails and a little bit further, but after that everything got dark turquoise and murky. Some tried to swim to the bottom and became white soles flapping in the green. Then the men took turns proving their manliness by jumping off the boat. Then flipping off the boat. Then jumping in unison. Then a game of catch when one of the guys started throwing cold beers from the boat to those in the water. We joined hands and feet and attempted an “A M” to honor the reason for our trip. It was the best part of the day, and I hated to haul my salty self back onto the boat and leave. On the way back to shore, someone on the boat crew turned on techno mixes of ABBA and our two-year old, blue-eyed blonde celebrity, Carly, and I danced our way to shore. The bus ride home was a quiet one. A weekend of food, sun, and water can quiet even the chattiest of pilots. I am loving your blog. I hope it’s ok ’cause I am sendingc it to my brother in LA. He’s an executive producer and if the gal who did the Julia Child blog can have a movie I can’t see why you can’t! OK? It sounds like you had a wonderful weekend! Thank you for showing the Vietnamese that Americans can be humble, gracious,respectful, and thankful (and fun!) Looking forward to the next……………Your friend you haven’t met yet, Shirley.